I recently read an article on personal health that included the Mayo Clinic food pyramid. 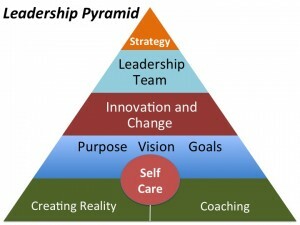 Hummm, do you suppose that a leadership pyramid impacts organizational health? Creating reality, establishing the contextual landscape, is the concept that leaders set the stage, create the container, and generally help the organization frame how it perceives the world. Call it organizational culture, the emotional system, or leadership presence, how you show up, interpret events and react to them sets the tone for the group you lead. It is very difficult for an organization to operate outside of the “reality” perceived by its leadership. What are you curious about these days? What about our company excites you the most? Who else I should be talking to? If you have time, make up your own questions based on what you are curious about, what keeps you up at night, and what excites you the most about your company. Moving up the leadership pyramid, we’ll come back to the circle at the end, we enter the zone of carbohydrates – leadership that provides the organization with energy. Purpose. Vision. Goals. I lump these three together to take advantage of their synergy. Purpose (why we are here) needs direction (Vision) and just enough structure (Goals) to keep people aligned. When your Purpose Mojo is working organization wellbeing is high, people are jazzed, and the energy is palpable. Vision supports all levels of the leadership pyramid – go west is the only direction needed when core principles are in place (Purpose) and people know where they are relative to each other and “west” (Goals). Goals allow us to measure our progress as we undertake intentional change, i.e. achieving our Vision. In today’s VUCA world (volatile, uncertain, complex, and ambiguous) goals have a much shorter life span. For example, if the budget is going to change, and whose isn’t, goals have to realign and adapt to the reality that exists. Protein is the next layer, the nutritional element that builds new structures – from enzymes to bones and muscles. In the leadership pyramid this layer is where innovation drives change and builds the future. It takes a while to see the effects of this layer, but without enough high quality protein (innovation and change) the whole organization becomes malnourished, unthrifty, and susceptible to dis-ease. As you fuel your organization with innovation and change, pay attention to the structures you are building and how they impact function – a runner would be slowed down by the muscles of a weight lifter and a ballerina would not get off the ground with an additional 20# of fat. Which brings us to the next layer of the pyramid – energy dense fats. These are fuels that pack a whollop and, in excess, can topple our diet. In the leadership pyramid, this layer is the executive team. Building your executive team (or your key colleagues and advisors) is about finding the healthy ones and weeding out those that clog the organizational arteries. Think a light dipping oil verses Crisco. The “Mediterranean” Diet of this level establishes a team that is positive, has complimentary strengths, and integrity. Sweets are at the top. They tempt us while reeking metabolic havoc on our blood sugar. A good sweet is a delight, savored, the experience drawn out, eaten a bite at a time. The top of the leadership pyramid is strategy; well made it goes a long way and is enjoyed by everyone. Leaders who spend an appropriate amount of time on the rest of the pyramid create the right sweet (strategy) for the meal (from creating reality to building their team). So what is that strange circle in the middle of the Mayo Clinic Food Pyramid? The wise folks in Rochester, MN realized that a food pyramid is incomplete without exercise, which they placed in the base to indicate its value. For the leadership pyramid the circle is Self Care – the work you do to keep yourself strong, healthy, happy, energized, and rejuvenated. If you as leader don’t take care of your self, your organization will be on a yo-yo diet – chasing you from heroic feats to complete exhaustion. The leadership pyramid is complete when you replenish and are focused, present, and fulfilled.